What Makes Organic Chemistry So Hard? One of the reasons many students find Organic chemistry so difficult is because Organic chemistry is a very demanding course. In Organic chemistry, students are tasked with learning a large number of reactions, nomenclature, and molecular theory, but we make this easy (How it Works). Many students have never encountered a course like this before, and become bogged down by the amount of information they must know. Students will attempt to study, become frustrated because they do not understand the information, and push studying it off. Without devoting sufficient time to the course, the first test will come by and many students will perform poorly. Our quiz mode allows students to prepare for exams like never before. You can learn the reactions backwards and forwards and not fall for any tricks by your professor. Hear what our students have said. The funny thing about Organic chemistry is you often hear people comment on how hard the course is, but how often do you hear people saying that the class is actually quite simple and, dare I say, even fun? Organic chemistry is not a difficult subject, and once you know it, it will become an enjoyable course as you blast your way through reaction after reaction. What any student who wants to perform well in the class needs is 100% commitment to learning the subject, and a rock solid study plan. Students often have trouble developing a good study plan. Firstly, students must be willing to devote at least 5 hours a week to studying Organic chemistry (the more the better!). Secondly, figure out a way to study Organic chemistry that works for you and keeps you motivated. Old fashion method. Take out your text book and practice problems. If you get stuck, consult your text book. This is a good method of learning Organic chemistry but can be very frustrating and progress can be slow (depending on how long you get stuck on a problem!). This method is good because even though you will struggle through the problems, when you finally figure out the answer, it will be very satisfying and motivating. Going over Notes. The notes your professor goes over in class are a very valuable reference and are less intimidating to go through than an Organic chemistry textbook. Notes are a great guides for what material will be on an exam and going over your notes often is a great way to stay up to date on what you should know. When practicing problems, your notes can be a very useful aid if you get stuck on a problem or concept. The Internet. The Internet is an amazing resource to use when studying Organic chemistry. You can find tutorials, online quizzes, and even break downs of each reaction. 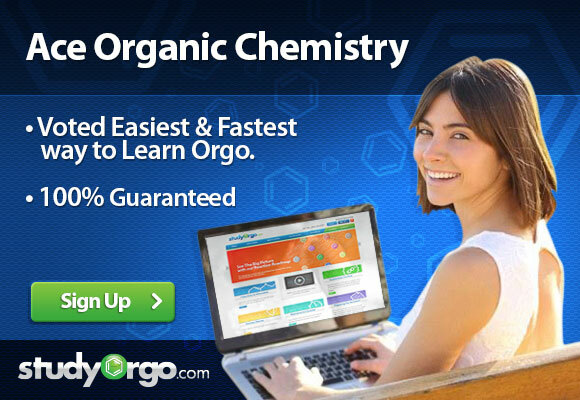 Here at StudyOrgo.com, you will find one of the most useful tools to aid you in your Organic chemistry studying. With interaction problems and practice quizzes, you will become a master at the many reactions you must know. StudyOrgo.com covers all of the reactions often taught in first semester Organic chemistry and for each reaction, you get the complete theory behind it. StudyOrgo.com will make studying Organic chemistry fun and very rewarding! The secret to performing well in Organic chemistry boils down to smart, effective studying. Students who do exceptional in Organic chemistry aren’t Albert Einstein or have a magic pill. These students are committed individuals who embrace the challenge of Organic chemistry and tackle it with a smart, effective study plan.